Daniel Brown Moore, who was a mason and county court clerk in Campbellsville, KY, donated this clock to (Bethel) First Presbyterian Church in that town at some time during the 1850s or 1860s. It is a non-striking clock, so that it would not disturb the church service. The clock stopped working in the 1950s or 1960s, so was given by the church’s Session to Daniel William (“Billy”) Mitchell, who was Mr. Moore’s great grandson, at his request. Mr. Mitchell had become an Elder in that church, after returning from World War II. He, in turn, donated a new electric clock to the church, and the old clock was repaired and hung on Mr. Mitchell’s wall at home. Many people who grew up in, and visited, that house spent hours listening to this old clock. Some people think of the clock’s rhythm as the heartbeat of our family. When Mr. Mitchell passed away in 2012, the clock was temporarily given to his grandson (me) who still has it. 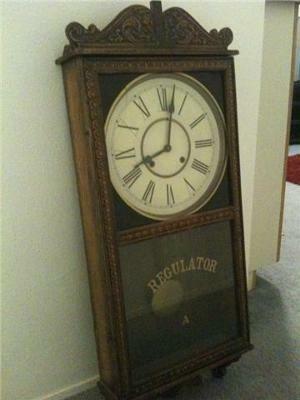 The clock is a Regulator, very much like this one: http://www.discoverclocks.com/images/what-clock-is-this-really-21316032.jpg.